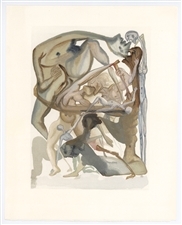 Spanish-born painter Salvador Dali (1904-1989), describing himself as descended from the Moors and therefore passionate about the gilded, excessive and luxurious, was just as unique in his eccentric personal behavior as in his art. Best known for his immediately identifiable, 1931 melting clocks painting entitled "The Persistence of Memory," Dali's early influences included Cubism and Dadaism. His formal training in Madrid lasted about four years until, just before graduation from the Real Academia de Bellas Artes de San Fernando, he was expelled for causing unrest. At this time, he traveled to Paris and met his idol, Pablo Picasso, who had already been made aware of Dali's unique talents by fellow Spanish painter Joan Miro. He was also introduced to several of Miro's Surrealist friends. 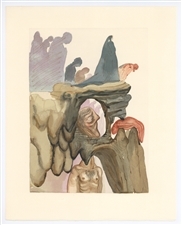 Salvador Dali works of art are unique and highly collectible. 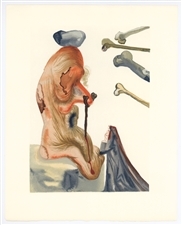 This is our selection of Salvador Dali prints and Dali lithographs currently available. 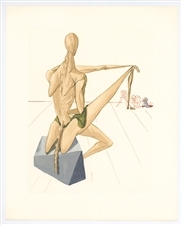 We're your affordable source of quality Salvador Dali prints for sale.